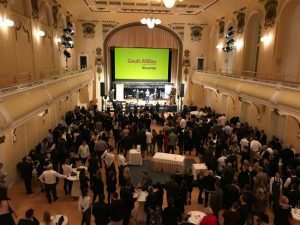 In Slovenia the first independent restaurant guide Gault & Millau in Slovenian and English language has been published, chef’s white hats have been awarded, as well as acknowledgments for outstanding performance in the Slovenian gastronomy. Mira Šemić, one of the most renowned wine experts in Slovenia, is responsible for bringing this well-known and globally acknowledged guide to Slovenia. The project has been supported by the Slovenian Tourist Board (STB). 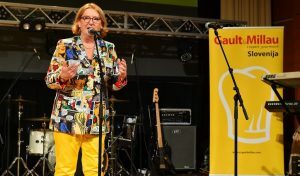 At the festive event Mira Šemić highlighted the importance of the guide for Slovenian gastronomy and according to her the Slovenian edition of Gault & Millau is a tribute to the Slovenian food and Slovenian wine, with it Slovenia has obtained a passport to the world’s gastronomy. The whole project was carried out with the support of the Slovenian Tourist Board. STB has recently made great efforts in the field of development and intensive promotion of gastronomy, it has developed several food festivals and has got in these activities important support of internationally renowned Slovenian top chefs with Ana Roš at the head. Recently, Slovenia has been proclaimed the European Region of Gastronomy 2021. Additionally, gastronomy will also be a two-year marketing theme of the STB in the years 2020 and 2021. Gault & Millau is one of the three most influential international guides in the world of gastronomy. In the past eight months, anonymous inspectors crossed Slovenia and independently evaluated 130 restaurants, 50 popular events (i.e. pop up places), 50 top quality wine cellars and 15 small breweries. Gault & Millau assigns chef’s hats to the restaurants. Restaurants that meet the criteria of Gault & Millau can get from one to five hats and are included in the guide. The method of evaluation is standardized. The restaurant also receives a number of points, whereas the highest possible rating is 20. 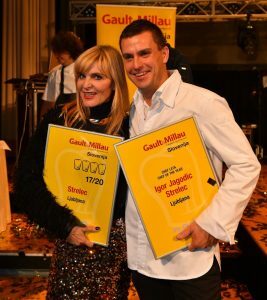 In the Slovenian edition of the guide the highest score was 17.5, which was given to two restaurants, Hiša Franko in Kobarid and Gostilna pri Lojzetu at Zemono Manor. They received four hats, along with Hiša Denk, Ošterija Debeluh, Mak Restaurant and Strelec. Igor Jagodic from Strelec restaurant was declared Chef of the Year 2019, Meta Repovž from Gostila Repovž was declared the Traditional Cuisine chef of 2019, Chef of the Future became David Vračko from MAK restaurant, the title of Young Talent belonged to Mojmir Marko Šiftar from Evergreen restaurant, and Janez Bratovž who runs JB restaurant was awarded for his contribution to the progress of Slovenian contemporary cuisine.